These highlights do not include all the information needed to use OXYCONTIN® safely and effectively. See full prescribing information for OXYCONTIN. Use the lowest effective dosage for the shortest duration consistent with individual patient treatment goals (2.1). To report SUSPECTED ADVERSE REACTIONS, contact Purdue Pharma L.P. at 1-888-726-7535 or FDA at 1-800-FDA-1088 or www.fda.gov/medwatch. Initiate the dosing regimen for each patient individually; taking into account the patient's severity of pain, patient response, prior analgesic treatment experience, and risk factors for addiction, abuse, and misuse [see Warnings and Precautions (5.1)]. Monitor patients closely for respiratory depression, especially within the first 24-72 hours of initiating therapy and following dosage increases with OXYCONTIN and adjust the dosage accordingly [see Warnings and Precautions (5.3)]. Instruct patients to swallow OXYCONTIN tablets whole, one tablet at a time, with enough water to ensure complete swallowing immediately after placing in the mouth [see Patient Counseling Information (17)]. Instruct patients not to pre-soak, lick, or otherwise wet the tablet prior to placing in the mouth [see Warnings and Precautions (5.11)]. Cutting, breaking, crushing, chewing, or dissolving OXYCONTIN tablets will result in uncontrolled delivery of oxycodone and can lead to overdose or death [see Warnings and Precautions (5.1)]. Use of higher starting doses in patients who are not opioid tolerant may cause fatal respiratory depression [see Warnings and Precautions (5.3)]. Step #2: If rounding is necessary, always round the dosage down to the nearest OXYCONTIN tablet strength available and initiate OXYCONTIN therapy with that dose. If the calculated OXYCONTIN total daily dosage is less than 20 mg, there is no safe strength for conversion and do not initiate OXYCONTIN. Step #3: Close observation and titration are warranted until pain management is stable on the new opioid. Monitor patients for signs and symptoms of opioid withdrawal or for signs of over-sedation/toxicity after converting patients to OXYCONTIN. [see Dosage and Administration (2.5)] for important instructions on titration and maintenance of therapy. Individually titrate OXYCONTIN to a dosage that provides adequate analgesia and minimizes adverse reactions. Continually reevaluate patients receiving OXYCONTIN to assess the maintenance of pain control, signs and symptoms of opioid withdrawal, and adverse reactions, as well as monitoring for the development of addiction, abuse and misuse [see Warnings and Precautions (5.1)]. Frequent communication is important among the prescriber, other members of the healthcare team, the patient, and the caregiver/family during periods of changing analgesic requirements, including initial titration. During chronic therapy, periodically reassess the continued need for the use of opioid analgesics. If unacceptable opioid-related adverse reactions are observed, consider reducing the dosage. Adjust the dosage to obtain an appropriate balance between management of pain and opioid-related adverse reactions. There are no well-controlled clinical studies evaluating the safety and efficacy with dosing more frequently than every 12 hours. As a guideline for pediatric patients 11 years and older, the total daily oxycodone dosage usually can be increased by 25% of the current total daily dosage. As a guideline for adults, the total daily oxycodone dosage usually can be increased by 25% to 50% of the current total daily dosage, each time an increase is clinically indicated. If the patient is currently taking a central nervous system (CNS) depressant and the decision is made to begin OXYCONTIN, start with one-third to one-half the recommended starting dosage of OXYCONTIN, consider using a lower dosage of the concomitant CNS depressant, and monitor patients for signs of respiratory depression, sedation, and hypotension [see Warnings and Precautions (5.6), Drug Interactions (7)]. For geriatric patients who are debilitated and not opioid tolerant, start dosing patients at one-third to one-half the recommended starting dosage and titrate the dosage cautiously [see Use in Specific Populations (8.5]. For patients with hepatic impairment, start dosing patients at one-third to one-half the recommended starting dosage and titrate the dosage carefully. Monitor for signs of respiratory depression, sedation, and hypotension [see Use in Specific Populations, (8.6), Clinical Pharmacology (12.3)]. When the patient no longer requires therapy with OXYCONTIN, taper the dosage gradually, by 25% to 50% every 2 to 4 days, while monitoring for signs and symptoms of withdrawal. If a patient develops these signs or symptoms, raise the dose to the previous level and taper more slowly, either by increasing the interval between decreases, decreasing the amount of change in dose, or both. Do not abruptly discontinue OXYCONTIN [see Warnings and Precautions (5.14), Drug Abuse and Dependence (9.3)]. OXYCONTIN contains oxycodone, a Schedule II controlled substance. As an opioid, OXYCONTIN exposes users to the risks of addiction, abuse, and misuse. Because extended-release products such as OXYCONTIN deliver the opioid over an extended period of time, there is a greater risk for overdose and death due to the larger amount of oxycodone present [see Drug Abuse and Dependence (9)]. Abuse or misuse of OXYCONTIN by crushing, chewing, snorting, or injecting the dissolved product will result in the uncontrolled delivery of oxycodone and can result in overdose and death [see Overdosage (10)]. Opioids are sought by drug abusers and people with addiction disorders and are subject to criminal diversion. Consider these risks when prescribing or dispensing OXYCONTIN. Strategies to reduce these risks include prescribing the drug in the smallest appropriate quantity and advising the patient on the proper disposal of unused drug [see Patient Counseling Information (17)]. Contact local state professional licensing board or state controlled substances authority for information on how to prevent and detect abuse or diversion of this product. To reduce the risk of respiratory depression, proper dosing and titration of OXYCONTIN are essential [see Dosage and Administration (2)]. Overestimating the OXYCONTIN dosage when converting patients from another opioid product can result in a fatal overdose with the first dose. Prolonged use of OXYCONTIN during pregnancy can result in withdrawal in the neonate. Neonatal opioid withdrawal syndrome, unlike opioid withdrawal syndrome in adults, may be life-threatening if not recognized and treated, and requires management according to protocols developed by neonatology experts. Observe newborns for signs of neonatal opioid withdrawal syndrome and manage accordingly. Advise pregnant women using opioids for a prolonged period of the risk of neonatal opioid withdrawal syndrome and ensure that appropriate treatment will be available [see Use in Specific Populations (8.1), Patient Counseling Information (17)]. Concomitant use of OXYCONTIN with a CYP3A4 inhibitor, such as macrolide antibiotics (e.g., erythromycin), azole-antifungal agents (e.g., ketoconazole), and protease inhibitors (e.g., ritonavir), may increase plasma concentrations of oxycodone and prolong opioid adverse reactions, which may cause potentially fatal respiratory depression [see Warnings and Precautions (5.3)], particularly when an inhibitor is added after a stable dose of OXYCONTIN is achieved. Similarly, discontinuation of a CYP3A4 inducer, such as rifampin, carbamazepine, and phenytoin, in OXYCONTIN-treated patients may increase oxycodone plasma concentrations and prolong opioid adverse reactions. When using OXYCONTIN with CYP3A4 inhibitors or discontinuing CYP3A4 inducers in OXYCONTIN-treated patients, monitor patients closely at frequent intervals and consider dosage reduction of OXYCONTIN until stable drug effects are achieved [see Drug Interactions (7)]. Concomitant use of OXYCONTIN with CYP3A4 inducers or discontinuation of a CYP3A4 inhibitor could decrease oxycodone plasma concentrations, decrease opioid efficacy or, possibly, lead to a withdrawal syndrome in a patient who had developed physical dependence to oxycodone. When using OXYCONTIN with CYP3A4 inducers or discontinuing CYP3A4 inhibitors, monitor patients closely at frequent intervals and consider increasing the opioid dosage if needed to maintain adequate analgesia or if symptoms of opioid withdrawal occur [see Drug Interactions (7)]. Profound sedation, respiratory depression, coma, and death may result if OXYCONTIN is used concomitantly with alcohol or other central nervous system (CNS) depressants (e.g., non-benzodiazepines sedatives/hypnotics, anxiolytics, tranquilizers, muscle relaxants, general anesthetics, antipsychotics, other opioids, alcohol). Because of these risks, reserve concomitant prescribing of these drugs for use in patients for whom alternative treatment options are inadequate. Advise both patients and caregivers about the risks of respiratory depression and sedation when OXYCONTIN is used with benzodiazepines or other CNS depressants (including alcohol and illicit drugs). Advise patients not to drive or operate heavy machinery until the effects of concomitant use of the benzodiazepine or other CNS depressant have been determined. Screen patients for risk of substance use disorders, including opioid abuse and misuse, and warn them of the risk for overdose and death associated with the use of additional CNS depressants including alcohol and illicit drugs [see Drug Interactions (7), Patient Counseling Information (17)]. Patients with Chronic Pulmonary Disease: OXYCONTIN-treated patients with significant chronic obstructive pulmonary disease or cor pulmonale, and those with a substantially decreased respiratory reserve, hypoxia, hypercapnia, or pre-existing respiratory depression are at increased risk of decreased respiratory drive including apnea, even at recommended dosages of OXYCONTIN [see Warnings and Precautions (5.3)]. Elderly, Cachectic, or Debilitated Patients: Life-threatening respiratory depression is more likely to occur in elderly, cachectic, or debilitated patients because they may have altered pharmacokinetics or altered clearance compared to younger, healthier patients [see Warnings and Precautions (5.3)]. Monitor such patients closely, particularly when initiating and titrating OXYCONTIN and when OXYCONTIN is given concomitantly with other drugs that depress respiration [see Warnings and Precautions (5.3, 5.6)]. Alternatively, consider the use of non-opioid analgesics in these patients. OXYCONTIN may cause severe hypotension, including orthostatic hypotension and syncope in ambulatory patients. There is an increased risk in patients whose ability to maintain blood pressure has already been compromised by a reduced blood volume or concurrent administration of certain CNS depressant drugs (e.g., phenothiazines or general anesthetics) [see Drug Interactions (7)]. Monitor these patients for signs of hypotension after initiating or titrating the dosage of OXYCONTIN. In patients with circulatory shock, OXYCONTIN may cause vasodilation that can further reduce cardiac output and blood pressure. Avoid the use of OXYCONTIN in patients with circulatory shock. In patients who may be susceptible to the intracranial effects of CO2 retention (e.g., those with evidence of increased intracranial pressure or brain tumors), OXYCONTIN may reduce respiratory drive, and the resultant CO2 retention can further increase intracranial pressure. Monitor such patients for signs of sedation and respiratory depression, particularly when initiating therapy with OXYCONTIN. Avoid the use of mixed agonist/antagonist (e.g., pentazocine, nalbuphine, and butorphanol) or partial agonist (e.g., buprenorphine) analgesics in patients who are receiving a full opioid agonist analgesic, including OXYCONTIN. In these patients, mixed agonist/antagonist and partial agonist analgesics may reduce the analgesic effect and/or may precipitate withdrawal symptoms. When discontinuing OXYCONTIN, gradually taper the dosage [see Dosage and Administration (2.9)]. Do not abruptly discontinue OXYCONTIN [see Drug Abuse and Dependence (9.3)]. OXYCONTIN may impair the mental or physical abilities needed to perform potentially hazardous activities such as driving a car or operating machinery. Warn patients not to drive or operate dangerous machinery unless they are tolerant to the effects of OXYCONTIN and know how they will react to the medication [see Patient Counseling Information (17)]. OXYCONTIN may increase the risk of serious adverse reactions such as those observed with other opioid analgesics, including respiratory depression, apnea, respiratory arrest, circulatory depression, hypotension, or shock [see Overdosage (10)]. The following adverse reactions have been identified during post-approval use of extended-release oxycodone. Because these reactions are reported voluntarily from a population of uncertain size, it is not always possible to reliably estimate their frequency or establish a causal relationship to drug exposure. Anaphylaxis: Anaphylaxis has been reported with ingredients contained in OXYCONTIN. Clinical Impact: The concomitant use of OXYCONTIN and CYP3A4 inhibitors can increase the plasma concentration of oxycodone, resulting in increased or prolonged opioid effects. These effects could be more pronounced with concomitant use of OXYCONTIN and CYP2D6 and CYP3A4 inhibitors, particularly when an inhibitor is added after a stable dose of OXYCONTIN is achieved [see Warnings and Precautions (5.5)]. Clinical Impact: The concomitant use of OXYCONTIN and CYP3A4 inducers can decrease the plasma concentration of oxycodone [see Clinical Pharmacology (12.3)], resulting in decreased efficacy or onset of a withdrawal syndrome in patients who have developed physical dependence to oxycodone [see Warnings and Precautions (5.5)]. If concomitant use is necessary, consider increasing the OXYCONTIN dosage until stable drug effects are achieved. Monitor for signs of opioid withdrawal. If a CYP3A4 inducer is discontinued, consider OXYCONTIN dosage reduction and monitor for signs of respiratory depression. Intervention: Reserve concomitant prescribing of these drugs for use in patients for whom alternative treatment options are inadequate. Limit dosages and durations to the minimum required. Follow patients closely for signs of respiratory depression and sedation [see Dosage and Administration (2.6), Warnings and Precautions (5.6)]. Prolonged use of opioid analgesics during pregnancy may cause neonatal opioid withdrawal syndrome [see Warnings and Precautions (5.4)]. There are no available data with OXYCONTIN in pregnant women to inform a drug-associated risk for major birth defects and miscarriage. In animal reproduction studies, there was no embryo-fetal toxicity when oxycodone hydrochloride was orally administered to rats and rabbits, during the period of organogenesis, at doses 1.3 to 40 times the adult human dose of 60 mg/day, respectively. In a pre- and postnatal toxicity study, when oxycodone was orally administered to rats, there was transiently decreased pup body weight during lactation and the early post-weaning period at the dose equivalent to an adult dose of 60 mg/day. In several published studies, treatment of pregnant rats with oxycodone hydrochloride at clinically relevant doses and below resulted in neurobehavioral effects in offspring [see Data]. Based on animal data, advise pregnant women of the potential risk to a fetus. The most frequent adverse events observed in pediatric patients were vomiting, nausea, headache, pyrexia, and constipation [see Dosage and Administration (2.4), Adverse Reactions (6.1), Clinical Pharmacology (12.3) and Clinical Trials (14)]. In controlled pharmacokinetic studies in elderly subjects (greater than 65 years) the clearance of oxycodone was slightly reduced. Compared to young adults, the plasma concentrations of oxycodone were increased approximately 15% [see Clinical Pharmacology (12.3)]. Of the total number of subjects (445) in clinical studies of oxycodone hydrochloride controlled-release tablets, 148 (33.3%) were age 65 and older (including those age 75 and older) while 40 (9.0%) were age 75 and older. In clinical trials with appropriate initiation of therapy and dose titration, no untoward or unexpected adverse reactions were seen in the elderly patients who received oxycodone hydrochloride controlled-release tablets. Thus, the usual doses and dosing intervals may be appropriate for elderly patients. However, a dosage reduction in debilitated, non-opioid-tolerant patients is recommended [see Dosage and Administration (2.7)]. Respiratory depression is the chief risk for elderly patients treated with opioids, and has occurred after large initial doses were administered to patients who are not opioid-tolerant or when opioids were co-administered with other agents that depress respiration. Titrate the dosage of OXYCONTIN slowly in these patients and monitor closely for signs of central nervous system and respiratory depression. [see Warnings and Precautions (5.7)]. A study of OXYCONTIN in patients with hepatic impairment demonstrated greater plasma concentrations than those seen at equivalent doses in persons with normal hepatic function [see Clinical Pharmacology (12.3)]. Therefore, a dosage reduction is recommended for these patients [see Dosage and Administration (2.8)]. Monitor closely for signs of respiratory depression, sedation, and hypotension. In patients with renal impairment, as evidenced by decreased creatinine clearance (<60 mL/min), the concentrations of oxycodone in the plasma are approximately 50% higher than in subjects with normal renal function [see Clinical Pharmacology (12.3)]. Follow a conservative approach to dose initiation and adjust according to the clinical situation. OXYCONTIN contains oxycodone, a substance with a high potential for abuse similar to other opioids including fentanyl, hydrocodone, hydromorphone, methadone, morphine, oxymorphone, and tapentadol. OXYCONTIN can be abused and is subject to misuse, addiction, and criminal diversion [see Warnings and Precautions (5.1)]. With parenteral abuse, the inactive ingredients in OXYCONTIN can be expected to result in local tissue necrosis, infection, pulmonary granulomas, increased risk of endocarditis, valvular heart injury, embolism, and death. Cases of thrombotic microangiopathy (a condition characterized clinically by thrombocytopenia and microangiopathic hemolytic anemia) associated with parenteral abuse have been reported. Parenteral drug abuse is commonly associated with transmission of infectious diseases, such as hepatitis and HIV. 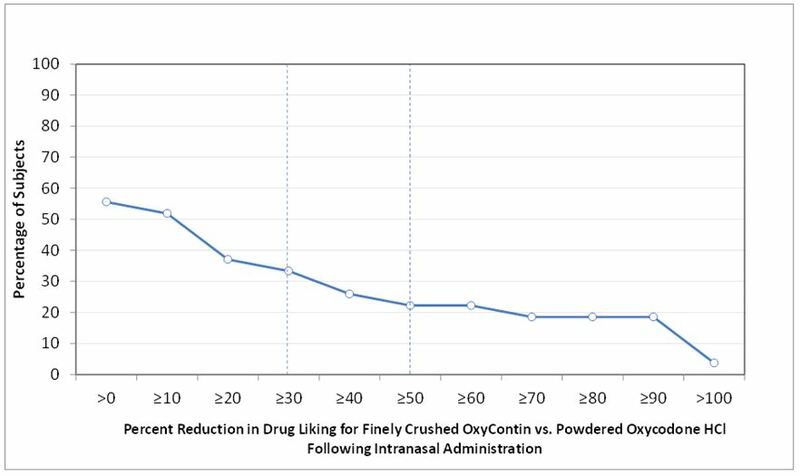 Figure 1 demonstrates a comparison of drug liking for finely crushed OXYCONTIN compared to powdered oxycodone HCl in subjects who received both treatments. The Y-axis represents the percent of subjects attaining a percent reduction in drug liking for OXYCONTIN vs. oxycodone HCl powder greater than or equal to the value on the X-axis. Approximately 44% (n = 12) had no reduction in liking with OXYCONTIN relative to oxycodone HCl. Approximately 56% (n = 15) of subjects had some reduction in drug liking with OXYCONTIN relative to oxycodone HCl. Thirty-three percent (n = 9) of subjects had a reduction of at least 30% in drug liking with OXYCONTIN compared to oxycodone HCl, and approximately 22% (n = 6) of subjects had a reduction of at least 50% in drug liking with OXYCONTIN compared to oxycodone HCl. OXYCONTIN contains oxycodone, an opioid agonist and Schedule II controlled substance with an abuse liability similar to other opioid agonists, legal or illicit, including fentanyl, hydromorphone, methadone, morphine, and oxymorphone. OXYCONTIN can be abused and is subject to misuse, addiction, and criminal diversion [see Warnings and Precautions (5.1) and Drug Abuse and Dependence (9.1)]. OXYCONTIN should not be abruptly discontinued [see Dosage and Administration (2.9)]. If OXYCONTIN is abruptly discontinued in a physically-dependent patient, a withdrawal syndrome may occur. Some or all of the following can characterize this syndrome: restlessness, lacrimation, rhinorrhea, yawning, perspiration, chills, myalgia, and mydriasis. Other signs and symptoms also may develop, including irritability, anxiety, backache, joint pain, weakness, abdominal cramps, insomnia, nausea, anorexia, vomiting, diarrhea, or increased blood pressure, respiratory rate, or heart rate. Oxycodone causes miosis, even in total darkness. Pinpoint pupils are a sign of opioid overdose but are not pathognomonic (e.g., pontine lesions of hemorrhagic or ischemic origin may produce similar findings). Marked mydriasis rather than miosis may be seen with hypoxia in overdose situations [see Overdosage (10)]. The minimum effective analgesic concentration will vary widely among patients, especially among patients who have been previously treated with potent agonist opioids. The minimum effective analgesic concentration of oxycodone for any individual patient may increase over time due to an increase in pain, the development of a new pain syndrome, and/or the development of analgesic tolerance [see Dosage and Administration (2.1, 2.5)]. There is a relationship between increasing oxycodone plasma concentration and increasing frequency of dose-related opioid adverse reactions such as nausea, vomiting, CNS effects, and respiratory depression. In opioid-tolerant patients, the situation may be altered by the development of tolerance to opioid-related adverse reactions [see Dosage and Administration (2.1, 2.5)]. Following intravenous administration, the steady-state volume of distribution (Vss) for oxycodone was 2.6 L/kg. Oxycodone binding to plasma protein at 37°C and a pH of 7.4 was about 45%. Once absorbed, oxycodone is distributed to skeletal muscle, liver, intestinal tract, lungs, spleen, and brain. Oxycodone has been found in breast milk [see Use in Specific Populations (8.4)]. Oxycodone is extensively metabolized by multiple metabolic pathways to produce noroxycodone, oxymorphone and noroxymorphone, which are subsequently glucuronidated. Noroxycodone and noroxymorphone are the major circulating metabolites. 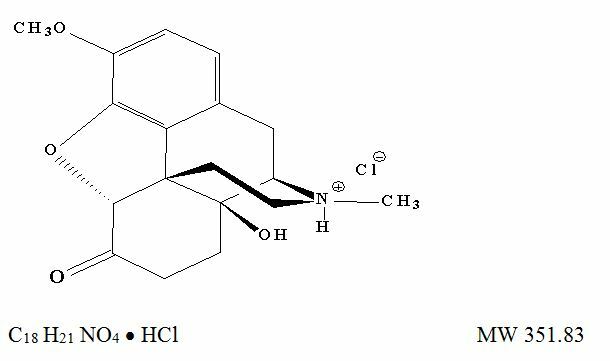 CYP3A mediated N-demethylation to noroxycodone is the primary metabolic pathway of oxycodone with a lower contribution from CYP2D6 mediated O-demethylation to oxymorphone. Therefore, the formation of these and related metabolites can, in theory, be affected by other drugs [see Drug Interactions (7)]. Across individual pharmacokinetic studies, average plasma oxycodone concentrations for female subjects were up to 25% higher than for male subjects on a body weight-adjusted basis. The reason for this difference is unknown [see Use in Specific Populations (8.8)]. CYP3A4 is the major isoenzyme involved in noroxycodone formation. Co-administration of OXYCONTIN (10 mg single dose) and the CYP3A4 inhibitor ketoconazole (200 mg BID) increased oxycodone AUC and Cmax by 170% and 100%, respectively [see Drug Interactions (7)]. Oxycodone is metabolized in part to oxymorphone via CYP2D6. While this pathway may be blocked by a variety of drugs such as certain cardiovascular drugs (e.g., quinidine) and antidepressants (e.g., fluoxetine), such blockade has not been shown to be of clinical significance with OXYCONTIN [see Drug Interactions (7)]. In a study of reproductive performance, rats were administered a once daily gavage dose of the vehicle or oxycodone hydrochloride (0.5, 2, and 8 mg/kg/day). Male rats were dosed for 28 days before cohabitation with females, during the cohabitation and until necropsy (2-3 weeks post-cohabitation). Females were dosed for 14 days before cohabitation with males, during cohabitation and up to Gestation Day 6. Oxycodone hydrochloride did not affect reproductive function in male or female rats at any dose tested (up to 8 mg/kg/day), up to 1.3 times a human dose of 60 mg/day. Inform patients that the use of OXYCONTIN, even when taken as recommended, can result in addiction, abuse, and misuse, which can lead to overdose and death [see Warnings and Precautions (5.1)]. Instruct patients not to share OXYCONTIN with others and to take steps to protect OXYCONTIN from theft or misuse. Inform patients of the risk of life-threatening respiratory depression, including information that the risk is greatest when starting OXYCONTIN or when the dosage is increased, and that it can occur even at recommended dosages [see Warnings and Precautions (5.3)]. Advise patients how to recognize respiratory depression and to seek medical attention if breathing difficulties develop. Inform patients that accidental ingestion, especially by children, may result in respiratory depression or death [see Warnings and Precautions (5.3)]. Instruct patients to take steps to store OXYCONTIN securely and to dispose of unused OXYCONTIN by flushing the tablets down the toilet. Inform patients and caregivers that potentially fatal additive effects may occur if OXYCONTIN is used with benzodiazepines or other CNS depressants, including alcohol, and not to use these concomitantly unless supervised by a healthcare provider [see Warnings and Precautions (5.6), Drug Interactions (7)]. Inform patients that opioids could cause a rare but potentially life-threatening condition resulting from concomitant administration of serotonergic drugs. Warn patients of the symptoms of serotonin syndrome and to seek medical attention right away if symptoms develop. Instruct patients to inform their healthcare provider if they are taking, or plan to take serotonergic medications [see Drug Interactions (7)]. Inform patients to avoid taking OXYCONTIN while using any drugs that inhibit monoamine oxidase. Patients should not start MAOIs while taking OXYCONTIN [see Drug Interactions (7)]. OXYCONTIN is designed to work properly only if swallowed intact. Taking cut, broken, chewed, crushed, or dissolved OXYCONTIN tablets can result in a fatal overdose [see Dosage and Administration (2.1)]. OXYCONTIN tablets should be taken one tablet at a time [see Dosage and Administration (2.1)]. Do not pre-soak, lick, or otherwise wet the tablet prior to placing in the mouth [see Dosage and Administration (2.1)]. Take each tablet with enough water to ensure complete swallowing immediately after placing in the mouth [see Dosage and Administration (2.1)]. Do not discontinue OXYCONTIN without first discussing the need for a tapering regimen with the prescriber [see Dosage and Administration (2.9)]. Inform patients that OXYCONTIN may cause orthostatic hypotension and syncope. Instruct patients how to recognize symptoms of low blood pressure and how to reduce the risk of serious consequences should hypotension occur (e.g., sit or lie down, carefully rise from a sitting or lying position) [see Warnings and Precautions (5.9)]. Inform patients that anaphylaxis has been reported with ingredients contained in OXYCONTIN. Advise patients how to recognize such a reaction and when to seek medical attention [see Contraindications (4), Adverse Reactions (6)]. Inform female patients of reproductive potential that prolonged use of OXYCONTIN during pregnancy can result in neonatal opioid withdrawal syndrome, which may be life-threatening if not recognized and treated [see Warnings and Precautions (5.4), Use in Specific Populations (8.1)]. Inform female patients of reproductive potential that OXYCONTIN can cause fetal harm and to inform their healthcare provider of a known or suspected pregnancy [see Use in Specific Populations (8.1)]. Inform patients that OXYCONTIN may impair the ability to perform potentially hazardous activities such as driving a car or operating heavy machinery. Advise patients not to perform such tasks until they know how they will react to the medication [see Warnings and Precautions (5.15)]. Advise patients of the potential for severe constipation, including management instructions and when to seek medical attention [see Adverse Reactions (6)]. Healthcare professionals can telephone Purdue Pharma’s Medical Services Department (1-888-726-7535) for information on this product. U.S. Patent Numbers 6,488,963; 7,129,248; 8,309,060; 8,808,741; 8,821,929; 8,894,987; 8,894,988; 9,060,976; 9,073,933; 9,492,389, 9,492,391, 9,492,392, 9,492,393, and 9,522,919.